The effectiveness of Agile methods, especially Scrum, is no longer a matter of debate. Agile's efficiency is being confirmed day after day by an ever-growing number of users. Not only is it being used successfully by hundreds of companies developing traditional products, it is now increasingly in use buy safety-critical product developers, too! As companies of all sizes are considering transitioning to Agile in the face of such convincing evidence, another challenge has arisen: that of scaling Agile to suit large organizations. Several methodologies (SAFe®, LeSS, etc) have been devised to help grow the Agile framework to adapt to the needs of large enterprises. Looking to implement Agile? Sign up for our Agile Training Course webinar series! Just this week, we had the chance to meet Jeff Sutherland, founder of Scrum, and one of the contributors to the Agile Manifesto, at the event titled UPscALE – Upscaled Agile in Medium & Large Enterprises. 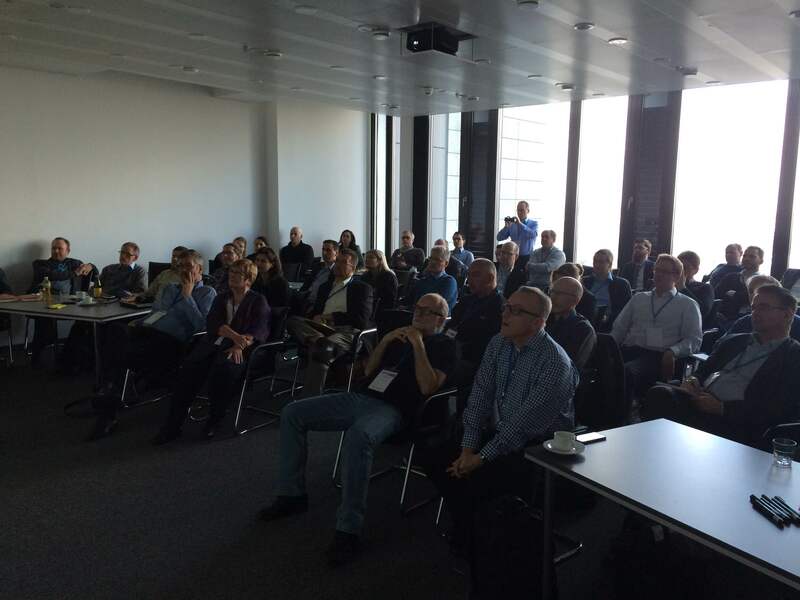 Organized by Scrum Events & held on 11 March 2015 right in our office building in Stuttgart, the event featured experts from various industries who took the opportunity to share their experiences about scaling the Agile framework. 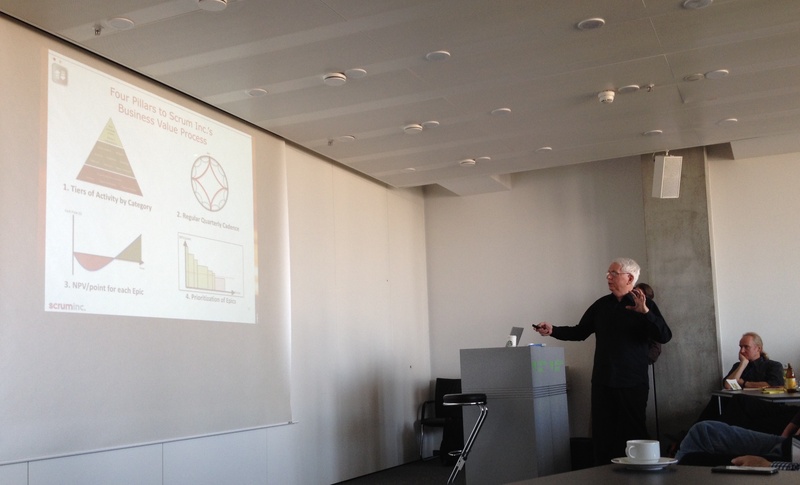 What's more, Jeff Sutherland gave a keynote speech titled Scrum @ Scale: Powering Up The Business. Let's see what he had to say about growing Scrum! "It's easier to scale velocity than it is to scale people." Adopting Scrum's values (Focus, Openness, Respect, Courage, Commitment) will significantly increase your velocity. Scale velocity first, then simply hire more people to expand your already Agile organization horizontally by building more self-governing Scrum teams that are interconnected with each other. Without really internalizing Scrum's values, however, what you're left with is a flawed Scrum "layer" over a traditional, hierarchical organizational structure. In this case, simply growing your teams won't really scale Scrum per se, it will scale an inefficient adoption of Scrum – in other words, it will just enlarge your problems instead of solving them. Jeff Sutherland suggests a modular approach to scaling, arguing that this helps "organizations to establish and improve Agile practices incrementally by focusing on one independent module at a time". In his keynote speech, Dr. Sutherland encouraged companies to build an Executive Action Team to facilitate the transition to Agile by aligning the organization along the transformation strategy. The primary objective of this team is to remove waste and impediments, and to manage & monitor the transition process. Dr. Sutherland expects continuous delivery to become the norm. Fully automated testing and deployment, where the Product Owner can simply deploy any incremental change with the click of a button, will become the standard procedure. Regarding scaling, he suggested to grow "out" (horizontally) rather than up (vertically). Swarming will allow for a continuous flow of development & release – semi-autonomous, collaborating groups of 50-150 people will be working on developing software that can be deployed any time. This allows for greater velocity, enhanced efficiency, and better quality products. Overall, Jeff Sutherland's keynote at UPscALE was an insightful talk on a problem that is faced by an increasing number of companies: efficiently growing Agile across large organizations. We were happy to see familiar faces on the event, as several members of the audience are using codeBeamer ALM to manage their lifecycles and scale Agile in their organizations. Thanks to Scrum Events for extending an invitation and for organizing this valuable event.